More than a dozen air travelers suffered minor injuries after a JetBlue plane made a hard landing in Sacramento, Calif., on Thursday afternoon. A fire broke out on one of the plane's wheels, but was quickly extinguished, according to a report on KCRA.com, citing witnesses. The low-cost carrier said initial reports indicated that Flight 262, flying from Long Beach, experienced brake problems. 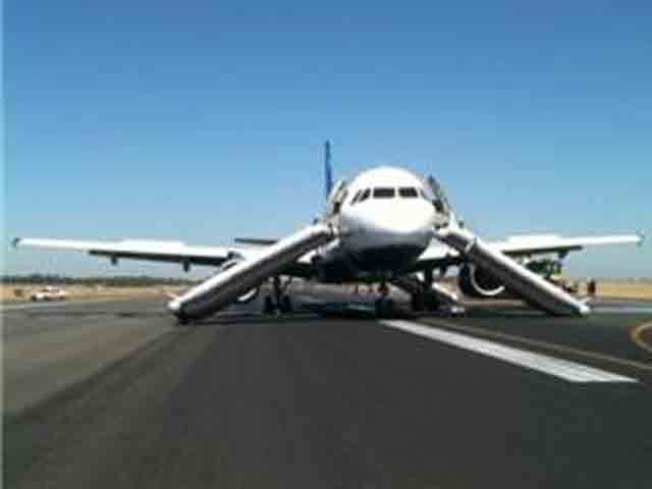 "The crew elected to evacuate the aircraft in an abundance of caution," the company said in a press release. "The airport fire department reported immediately to the airfcraft and EMS personnel are on-site to assist. The Airbus A320 blew two tires upon touching down shortly before 1 p.m., an airport representative told KCAS.